As a partial shutdown approaches that would affect hundreds of thousands of federal workers, the chairman of the conservative House Freedom Caucus said that public servants should have known this was part of their jobs when they were hired. 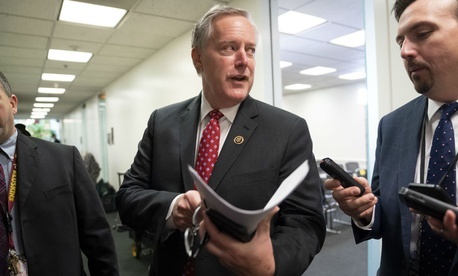 According to The Washington Post, Rep. Mark Meadows, R-N.C., was asked about the impact of a shutdown on the Border Patrol agents and Transportation Security Administration screeners who would be required to keep working over Christmas without a paycheck. Meadows took fire for those comments on social media. One of his departing colleagues in the House, Rep. Ryan Costello, R-Pa., in a tweet tied Meadows's comments to concerns about hiring in the federal government. Others noted that Meadows's job was to govern. Meadows did announce on Thursday night in a letter to the House Chief Administrative Officer that he also posted on Twitter that he would not be accepting a salary as long as the shutdown lasts. According to a Thursday Politico report, Meadows was a leading voice in pushing President Trump to stand firm on funding for his border wall. Another member of Congress, Rep. Scott Perry, R-Pa., also weighed in on the shutdown and feds' finances on Thursday, comparing the plight of furloughed workers to that of those in the private sector, in a conversation relayed by Politico's Sarah Ferris on Twitter. Then compared the shutdown to a private company, specifically like GM, closing. "Why are government employees so sacrosanct? Private sector employees deal with this all the time... The government’s not immune to these things." Perry's comments were also met with criticism on Twitter, including by one self-identified GS-13. @RepScottPerry I'm a GS-13 and my family & I DO live paycheck to paycheck. While I am blessed to have this job, missing ONE check puts me in jeopardy of making my house payment, my car payment, etc. If Feds don't get paid (or pay delayed) - YOUR pay should be affected the same.